* please read 'usage guide' before purchase. 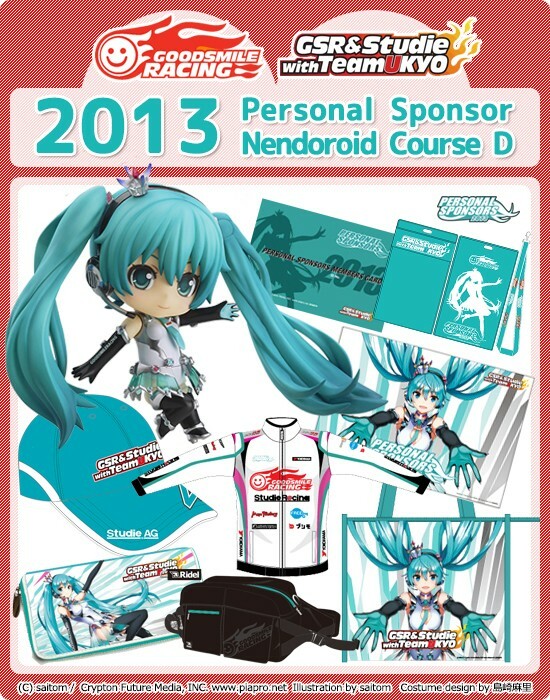 With our Hatsune Miku car competing in the Super GT, GSR&Studie with TeamUKYO is now recruiting Personal Sponsors with this all new course that includes a Racing Miku 2013 Ver. Nendoroid. It includes a Nendoroid-sized car modeled after the Miku GT BMW and a race queen parasol. But that's not all, this course also comes with a Microfiber Tapestry of Racing Miku 2013, Racing-Suit Replica Jersey, Racing Miku 2013 Ver. Graphic Design Wallet, GRS Original Waist Bag, and Original Cap. *As this course inclues all the benefits of becoming a Personal Sponsor, this cost is reflected in the price. ・Nendoroid Racing Miku 2013 Ver.